These wonderful aromatherapy bath salts are made with coarse grain Celtic sea salt (imported from France), our exclusive SomaTherapy B-Well blend of essential oils, and natural dried flower petals. Use for a relaxing bath or foot soak. 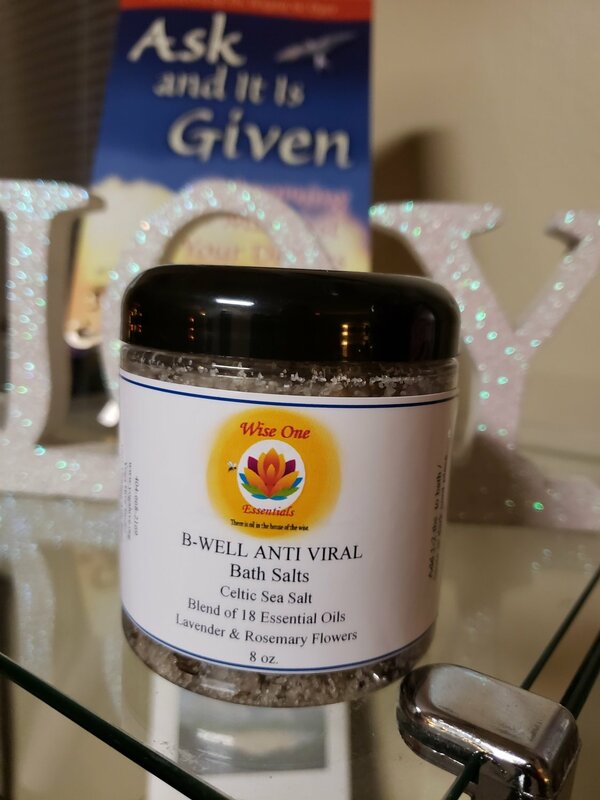 The next time you feel under the weather, run yourself a hot bath, pour in a tablespoon or two of our B-Well Bath Salts, breathe deeply, and allow your body to take in the aromatic benefits of essential oils. Our B-Well Blend of 100% Pure Essential Oils has both antiviral and antibacterial properties and contains the following Essential Oils: Bergamot FCF, Cajeput, Cardamom, Cypress, Eucalyptus Globulus, Eucalyptus Citriodora, Lavender, Lemon, Sweet Marjoram, Melissa, Myrrh, Niaouli, Peppermint, Ravensara, Rosemary, Rose Otto, Tea Tree and White Thyme. Our Aromatherapy Bath Salts are available in 8oz and 16oz sizes.